Christmas is my favorite holiday. I just love how the smell of a fresh cut tree creates a sense of coziness to a home. Candles also are great at doing this especially during the holidays. Aromas of Cinnamon Stick, Jack Frost and Mistletoe and Berries, make your home say "welcome". Candles have a long history of being used during the holidays when many homeowners attached candles to the branches of their Christmas Trees. Martin Luther, a monk, is credited with starting this trend in the early 16th century. 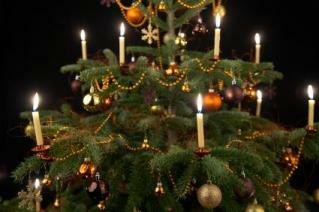 The story goes that he brought home a tree and lit it with candles to show his children how the stars twinkled at night. We certainly would not recommend doing this today but we do recommend burning holiday scented candles and what better candles to burn than eco-friendly soy candles made from 100% soy wax. This makes them the sustainable candle choice for your seasonal decorations.